Using your slow cooker saves time, and energy! 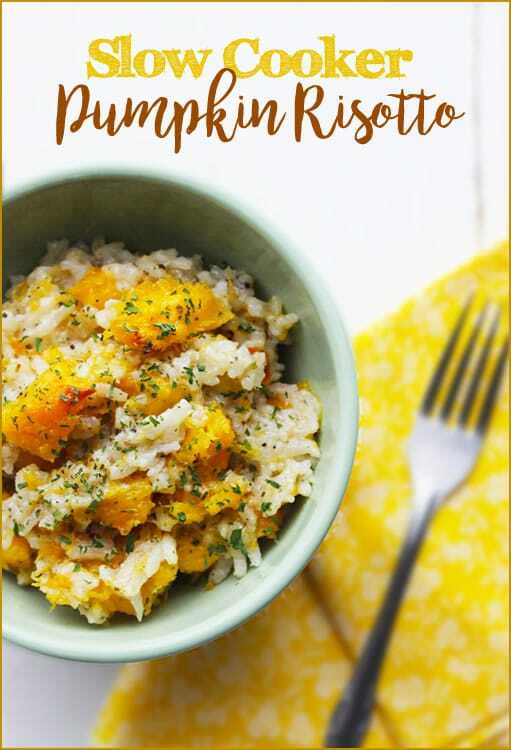 With very little effort on your part, you can enjoy this healthy pumpkin risotto that tastes like you slaved away in the kitchen for hours. I just love it when October rolls around. The leaves start changing, the temperatures start dropping, and pumpkin spice lattes start appearing everywhere. One of the things I look forward to in October is Andrew’s Unprocessed movement. As someone who values clean eating and living, I just love that so many people come together to sign the unprocessed pledge every year! Thanks for everything you do to remind us that clean, unprocessed living is the way to go, Andrew! For this year’s October Unprocessed, I’ve decided to focus on healthy, all-natural recipes that will save time in the kitchen. With full days of school every day of the week, sports, church life, and blogging, it’s taken all my energy just to punch out three home-cooked healthy meals a day! We all want to eat healthy, right? But a lot of times I find people think they just don’t have the time or energy to cook healthy food. It’s so much easier and faster to stop by your favorite fast food chain, pick up some burgers and fries, and head home. But, I promise you, cooking healthy, unprocessed foods does not have to take hours in the kitchen. And I’ve created this slow cooker risotto recipe to prove it! 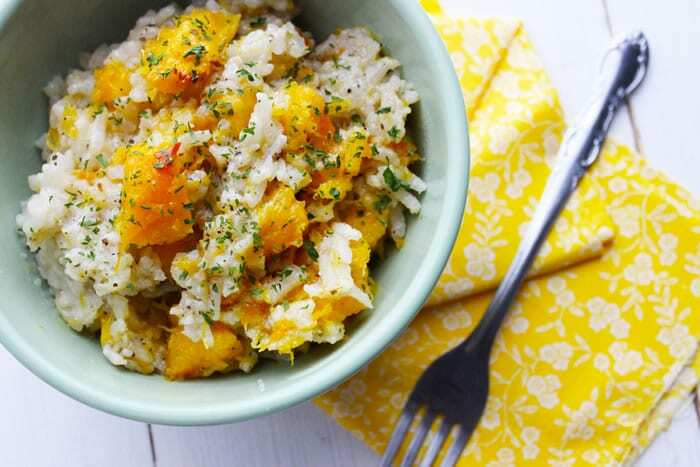 This October, celebrate the unprocessed movement with a little help from your slow cooker. With very little effort on your part, you can enjoy a healthy home-cooked meal that tastes like you slaved away in the kitchen for hours. With very little effort on your part, you can enjoy a healthy home-cooked meal that tastes like you slaved away in the kitchen for hours. In a medium-sized pot, cook the olive oil, sage, garlic, and onion over medium heat, until the onion softens, about 4-5 minutes. Stir in the Arborio rice, and cook for an additional 2-3 minutes. Transfer the rice to a lightly greased slow cooker, and stir in the vegetable broth, salt, and pepper. Cover the slow cooker pot, and cook on high for 1.5 hours, until the rice is tender. Stir in the roasted pumpkin (or puree, if using), and taste. Add salt and pepper, if necessary, and enjoy! To make the roasted pumpkin, cut a sugar pumpkin in half, and scoop out the seeds with a spoon. Drizzle the pumpkin halves with 1 tablespoon olive oil, and sprinkle with salt, pepper, and 1 teaspoon dried sage. Roast at 350° for 80-90 minutes, or until fork-tender. Once roasted, remove the pumpkin from the oven, and let cool. Once cooled, remove the outer skin, and use a fork to cut the roasted pumpkin into chunks. I’m a little confused about the use of white rice in this recipe and others on this site. Isn’t white rice a big no-no during October Unprocesed? 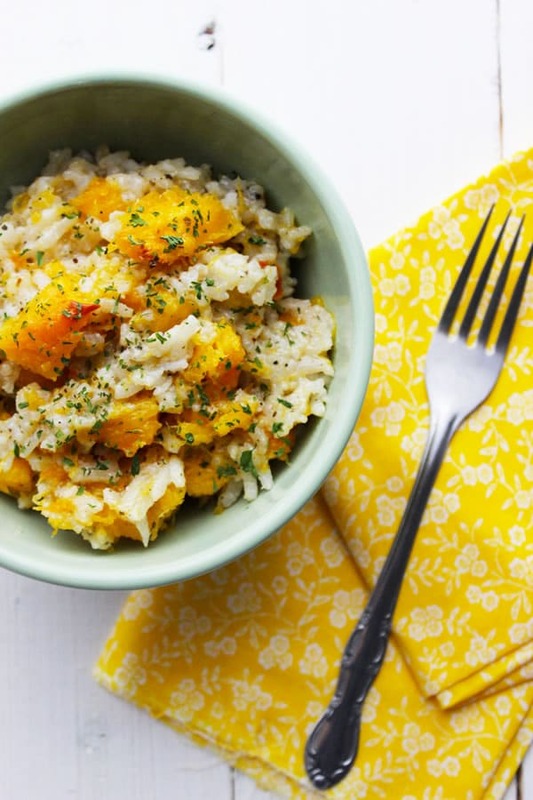 Brown rice risotto is a bit more earthy in flavor but delicious with pumpkin. I’ve never tried risotto in a slow cooker before. This does sound easy. Do you think I could use canned pumpkin in this recipe? I’ve made risotto in a rice cooker and it worked really well. Hmmm – never thought of a slow cooker. Great idea. And if you switch to brown rice, yes you need more time and probably more liquid, I would think.